What a week! Phew. Thank YOU! The passionate power of coming together and taking action really shined -- everyone took an active role in helping to protect the first museum in Los Angeles, the Southwest Museum, and the Casa de Adobe. Our collective work continues as the hearing results were surprising. 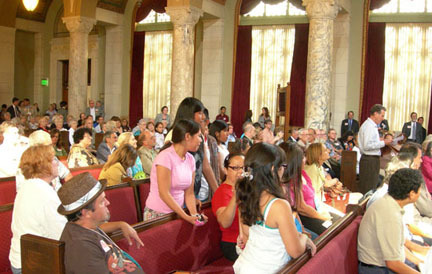 The Board of Referred Powers did NOT slamdunk the Autry approvals (as feared) but instead voted to continue the item for four weeks and directed Councilmember Huizar to spend this time working out a legally enforceable commitment with the Autry that protects a museum future at the historic Southwest Museum and Casa de Adobe. We write this with cautious optimism. We hope this change will produce a more equitable project that addresses the community concerns about the Southwest Museum and Casa de Adobe AND protects our Griffith Park. And in a surprise turn of events, Councilmember Huizar has come around to the Coalition’s position of a legally enforceable commitment. 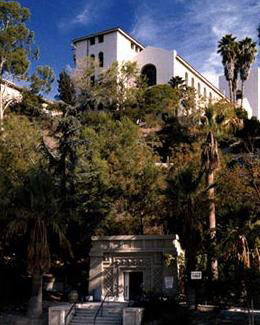 He asked the Board of Referred Powers for time so that his office could link the approval of Autry’s project in Griffith Park to a legal agreement to restore and reopen the Southwest Museum. He stated that this agreement also needed to address the amount of exhibition space for the Southwest Collection, a Master Plan and a timeline for implementation. This is a positive change from 2007 when Huizar and the Mayor accepted a “commitment memo” sent by Autry to Huizar. That memo outlined Autry’s “plan” to redevelop 90% of the building for non-museum display purposes converting it to another use with only 10% of the space allocated for a small display of the Collection (the 2 rooms). They also proposed to change the name, forever abandoning the independent identity of the Southwest Museum and its legacy as the first museum in Los Angeles. And, provided no exhibit space to continue schoolchildren’s fieldtrips at this location. Here’s a link to this 2007 document. Additional positive outcomes from the Committee members who expressed questions and concerns about the proposed project and its environmental documents. Thank you to Councilmember Reyes for expressing the most important fact – that the Southwest Museum institution is inherently part of the Autry’s project and should have been considered. Councilmember Parks indicated that the traffic was in need of re-evaluation, based upon the Minagar consultant report (which our Coalition participated in with three neighborhood councils). All of this discussion showed that the five councilmembers on the Board of Referred Powers were paying attention and had concerns about the proposed project itself in addition to the issues of the Southwest Museum and Casa de Adobe. So, the hard work now begins. We have requested a seat at the table with Councilmember Huizar to work on this legally binding agreement. There will be another hearing in four weeks. Now is the time to stay engaged and excited that the voice of the people can make a difference. Without each of you and your actions this would not have been possible. YOUR ACTIONS MATTERED Our Coalition pulled together a record of participation in various ways. There were so many supporters at the Tuesday meeting that the City could only accommodate the crowd by shifting the hearing room to the largest meeting location in City Hall -- Council Chambers. There was a bit of chaos that everyone handled well. Also, we’ve been told that the emails/faxes and phone calls that everyone did in advance of Tuesday was “record numbers” for ANY issue before the City! Thank you as many have shared your experience with us and we appreciate you keeping us informed of news, tips and your insight. And, the media is starting to wake up now; I’ve pasted some news article links below. Thank you. Have a great holiday weekend.